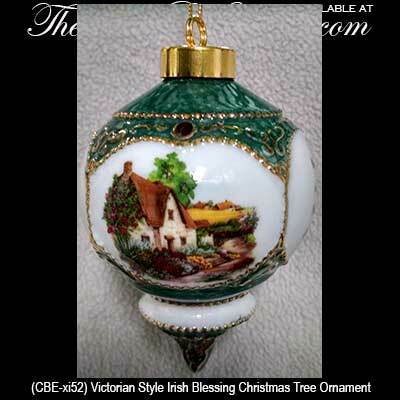 This Irish ornament is a Victorian style design that features a blessing along with a thatched roof cottage. The Irish Christmas ornament is enhanced with three panels with the blessing repeated. 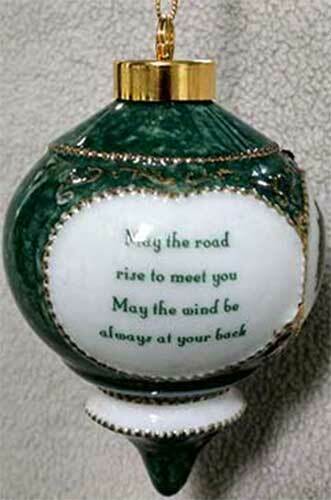 The Irish blessing bauble is made of white porcelain with green and gold accenting; it measures 2 3/4" wide x 4" tall. The Irish blessing Christmas ornament is gift boxed, complements of The Irish Gift House.